A contemporary woman these days is extremely talented and multi-faceted—full of color, confidence, grace, and accomplishments. A single aspect of her life no longer delineates her, which is why Ralph Lauren celebrates and emphasizes her many sides with the Big Pony Collection for Women, a series of four fragrances embracing and encouraging dynamic femininity. Today’s new generation of women is surely making a mark, and they can do so complete with a fragrance collection they can call their own—matching a multitude of personalities, passions, and achievements, and coordinating her fashion according to her moods and occasions. 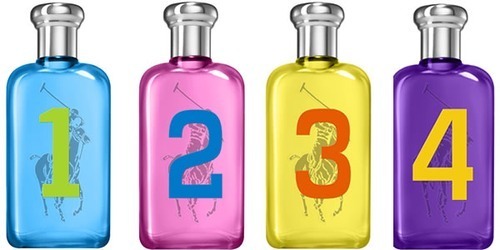 These four colorful scents comprise of Big Pony #1, the Sporty Fragrance, Big Pony #2, the Sensual Fragrance, Big Pony #3, the Free-Spirited Fragrance, and Big Pony #4, the Stylish Fragrance. All four are bright, frisky and energizing, and each bottle evidently expresses a point of view. Big Pony #1 is a floral citrus scent that features Grapefruit and Blue Lotus for a vibrant feel, and induces self-assurance, vitality and fearlessness while awakening the senses. Big Pony #2 is a flowery-fruity scent, with Cranberry and Tonka Mousse as its key ingredients, for an alluring, irresistible and romantic nature. Big Pony #3 is for the eccentric, rebellious and independent woman, highlighted by Floral Green, Pear and Mimosa. Lastly, Big Pony #4, which contains Wild Cherry and Purple Amber, is designed to give an edgy yet elegant vibe. The fragrances, which come in completely cute, pulsating bottles of blue, pink, yellow and purple, allow every woman to express her character and demonstrate all aspects of her personality. The March box boasts sample sizes of Big Pony #1 and Big Pony #3, perfect for travel, and can easily fit the smallest clutches and handbags. Together with Ralph Lauren, Glamourbox celebrates the multi-dimensional woman of today! Grab a box now and let the Big Pony Collection invigorate yours and everyone else’s senses. Cop This Look: Baby Spice x Harley Quinn!